This is it. The last shopping weekend before Christmas. One last trip to the bank for the holiday season. It's too late to make nice things for everyone on your list. You'll have to buy what you need, now. That creation in the photo? 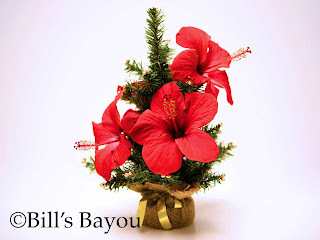 Someone in the office thought it'd be nice to take some of their hothouse hibiscus flowers and adorn the mini Christmas tree on their desk. Perhaps we put too much rum in the egg nog.